If due notice is not provided, one term’s fee of the current annual tuition fee will be charged in lieu. On behalf of the Humanities Learning Area it gives me great pleasure to acknowledge students who achieved outstanding results in the recent Australian Geography Competition and the Australian History Competition. The Australian Geography Competition is a contest for Australian secondary school students which assesses their geographical knowledge and skills. The competition aims to encourage student interest in geography and to reward student excellence. Over 70,000 students from all over Australia competed in the competition this year and there were a number of excellent performances from Corpus students. DISTINCTION - The following students achieved a distinction. They were in the top 10 % of all participants. HIGH DISTINCTION - One students achieved a high distinction. They were in the top 5% of all participants. HIGH DISTINCTION - One student in Year 8 achieved a high distinction. ONE STUDENT ACHIEVED AN OUTSTANDING RESULT – SHE WAS IN THE TOP 1% IN AUSTRALIA FROM THE 70,000 STUDENTS WHO PARTICIPATED. THIS IS A PHENOMENAL EFFORT. Thousands of students from all over Australia participated. Students knowledge, skills and understandings of history were assessed by the competition. HIGH DISTINCTION – ONE STUDENT IN YEAR 8 ACHIEVED IN THE TOP 5% OF STUDENTS IN AUSTRALIA. THIS IS A REMARKABLE EFFORT. HE ACHIEVED 88% IN THE COMPETITION. CLEARLY HE IS A VERY TALENTED YOUNG HISTORIAN. In Year 9, congratulations for achieving Credits to SIOBHAN STEVENS, KALEA GOWLAND, NICHOLAS NG, BYRON DEVENE, SARA POI, TERINDER RIKHRAJ, LACHLAN ALLEN, MOSAIA MCDONALD, ADAM NERI, MELVIN DING, JAMIE HOLLOWAY, SHERNEI LAM, LEEUWIN PAVY, MARINA PIPER, CHLOE JAMES, KONRAD RUCKI, DANIEL SANTINI and RAHUL CORREIA. On Friday, 11th August 2017, two teams of three Year 9 students took part in the Aurecon Bridge Building Competition held in Western Australlia at Scitech. Bridges had to be made from only 200 grams of balsa wood and cardboard but had to span a distance of 650 mm. Over 40 schools submitted entries. Many lunch times in Term 2 as well as many before and after school hours, together with a couple Sunday’s in Term 3, were spent in designing and building their bridge with the limited amount of materials permitted. Judging of the bridges included aesthetics as well as strength. We congratulate Thomas Berkovic, Edison Foo and Thomas Nicholls for coming fourth in their group of 20 schools. Their bridge supported a load of 35.0 kg. We also congratulate Konrad Rucki, Yannick Machado and Brandon Lim for coming eleventh in their group of 20 schools. Their bridge supported a load of 7.2 kg. The judges commented on the innovative design of this bridge. 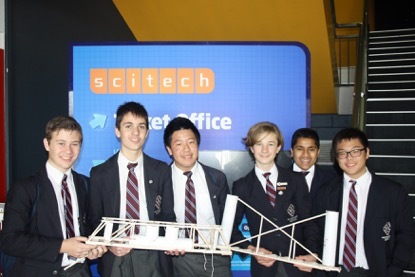 The winning school was Baldivis Secondary College whose bridge supported a load of 81.3 kg. All of the students were challenged by this fun activity and it has, perhaps, sparked an interest in a career in Engineering. The Year 8 social was held in the auditorium on the first of September. It was a fun-filled night complete with games, pizza and a selection of popular tunes. The auditorium was decorated with festive balloons and colourful lights! The DJ prepared some really good song choices, and the Year eights took to the stage to show off their best moves. He rewarded these dancers with flashing sunglasses, light-up rings and other cool accessories. While the students were dancing and socialising, they had the option to participate in minute to win it games. We had a pantyhose on the head skittle race, cookie face challenges and many more hilarious and enjoyable activities. There was even a ‘hold a spaghetti in your mouth and loop the fruit loops onto it’ game (which ended in a fierce playoff between the two finalists)! It was really fun to see the enthusiasm and energy in the year eights as they participated with their friends. Do you want to experience what it’s like to be a Murdoch University student for a day? If you are currently in Year 9 or 10, we have the perfect opportunity for you! Join us for the day as you create your own customised university timetable of activities, and meet new friends while you explore the campus and take part in hands-on workshops in areas that interest you. You will have the chance to speak with current Murdoch students and learn from the talented and inspiring lecturers that teach here. Spots are limited, so register today! There are two dates available, but you will only be able to sign up for one of the dates. Cost: Free! You only need to bring money for your lunch. On the 14th of September, the Year 7’s and their Grandparents met at St. Thomas More Parish Catholic Church for a celebration of the exaltation of the cross. During this mass, we celebrated our grandparent’s wisdom and kindness, and we also remembered those who have passed before us. After this special mass, our Year 7s escorted their grandparents to a pleasant morning tea and a tour around the Art and Technology Exhibition. Overall, this was a very pleasant occasion and it showed our grandparents what an amazing school this is.